This outpost of Hakata Tenjin Ramen looks more like a makeshift shelter leaned up against another building than a restaurant. It’s open air entrance faces the street with the remainder of the restaurant shrouded in plastic tenting. The inauspicious exterior marking what would surely be the home of delicious ramen. Staffed by one hostess/server and two cooks, this is a utility ramen stop for the late night salaryman crowd. A quick stop for ramen may only last 10 minutes. The service is efficient, and they work hard to get customers from the street with a grumbly irashaimasen, or welcome! 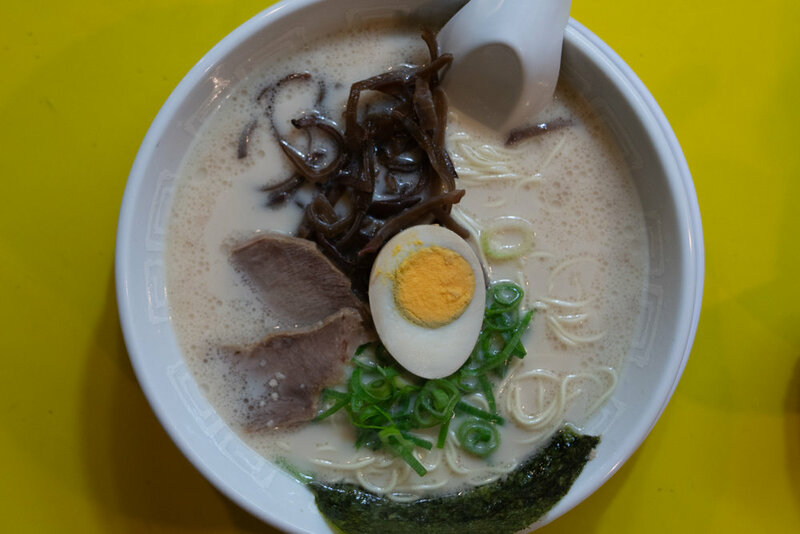 Rich tonkotsu pork broth in the Hakata (Fukuouka) style is the ramen of choice here served up with a shoyu egg, chashu, nori, and green onions. The noodles are thin and perfectly katame, or al dente loosely translated. While the setting is delightfully lackluster, and could be described as a hole in the wall, don’t let that stop you. The ramen here is first rate, and all at the incredible price of ¥500, or roughly $4.50-5.00 USD. This became the noodle joint of choice for my daughter and I to have a quick late night snack as we adjusted to the time change, and was very convenient to our hotel just down the road APA Hotel Shinjuku Gyoen Mae. The neighbourhood actually has a handful of noteworthy noodle shops including the Michelin Starred Konjiki Hototogisu, so if you are staying here it is easy to sample the flavours and styles from a variety of shops. The no-frills setting combined with the delicious Hakata style broth is a delicious sensory reminder of my days in Fukuoka — the city where I first fell in love with ramen.